So when friends aren't around, and there is no uni work left pending, and only a small amount of youth group type planning on the go, I have a few days spare in which to entertain myself. Almost immeadiately, boredom threatens. So I'm seeking to fill my time productively with those things I remember longing to have enough spare time to do whilst shut up in my bedroom/the library back in may learning about everything from the particle sizes of various types of aerosols to the many different forms of insulin available and what to do if the doctor forgets to sign the prescription amongst other world shattering situations. Today I had a short scrap booking session, ordering online some bargainous photo prints to add in, and I also completed my first 'read it swap it' swap. Read it Swap it is a website designed for, you guessed it, swapping old books. It's as simple as offering up a list of books, waiting until somebody requests a swap and then choosing one of their books with which to swap with. I don't yet see how this is an improvement on the library service because it still costs for postage and packaging, but as they say 'you can't knock it til you've tried it' so I await my next package in the post with great anticipation. Also on today's agenda was lots of tea drinking, university challenge, chilling with the cat, painting my nails (red, as usual.) spending too long on the internet reading theology blogs (what's the deal with that? ), cooking dinner for my family and this evening sewing up a hole in a pair of tights (hopefully, good as new!) whilst watching a ridiculous 80's film called 'The Thing' with my parents. I even browsed a website which had loads of adverts on it for musicians wanted. I quite like the idea of being in a band again, or even doing more little chilled out jam/sing songs like the good old days. I fear, although I'm not sure whether I should, things getting a little dull. Perhaps this is just because i'm not really used to having so much time doing next to nothing, but I've been thinking about other things, little projects I could get involved in to mix things up a bit, either over the next few weeks or months, or even back at uni. Suggestions on the back of a postcard, please. So tomorrow, there will be tea in abundance, although our newly tiled kitchen is still not quite back to normal. I may have to spend the morning consulting the pre prepared freedom board of rainy day activities. During exams I had fun with coloured pens on a large sheet of paper, writing down all of the things I'd like to do once the summer holidays were officially upon us. Our house in Norwich had at least 3 freedom boards (named boards to infer no obligation rather than using the potentially stress inducing term 'list') up on our respective bedroom walls , and mine is still in place. It will be interesting to take it down on my return in a couple of weeks to see how I'm getting on with all the fun things I had planned! On the freedom board, I remember writing 'do a big painting', after being inspired by a programme Katie and I watched on TV, about Mattisse. Today I remembered this pledge although the painting shown below, a San Antonio Sunset, is just A4 size due to my cuts in spending at The Works. 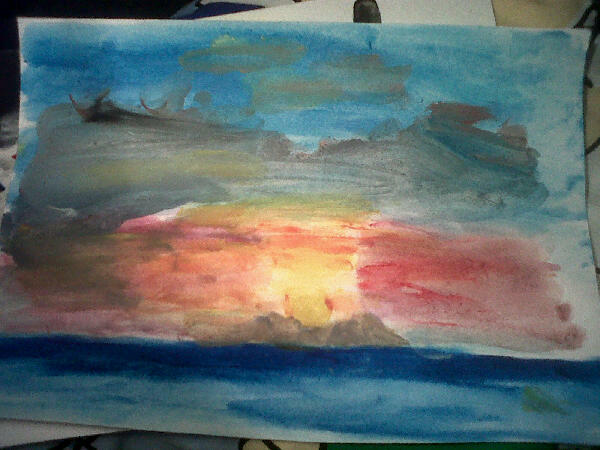 I did it with watercolour paints using my fingers because I don't have a paintbrush. Rock and roll. It looks a little as though the sun is setting into a mountain, but these were just intended to be darker coloured clouds. I am by no means an artist, and I realise that my twenty minutes of finger painting this afternoon looks like the contents of a primary school drying rack, but I quite like it! Certainly, with my perhaps too harsh scepticism of modern art, and everything being whatever you want it to be, this is a work of Ibizan inspired art.